Welcome to our PiWars 2015 blog. In the blog we’ll be talking about our 2014 entry TractorBot, our team, some suitably vague information about our 2015 entry plus a few side topics for variety. I’ve already given away that we entered the 2014 PiWars and to say that competition day was a roller coaster ride of emotions is no exaggeration. No matter how much you test your bot there’s still a lot of tension while it’s running one of the challenges. It was also tremendous fun. Building a robot and running it around the floor is quite an achievement and pretty cool but going head to head with other people’s creations takes it to a whole new level. The robots at the event came in all shapes and sizes, from a pirate galleon to some tiny tracked creations to a black box covered in LEDs. Everyone was excited to take part and had worked hard on their entries, with added Lego stunt drivers or massive staring eyes added to show it wasn’t too serious. Our main robo-nauts were Keith Ellis and Phil Willis with a small band of moral supporters. Their first design decision was whether to go for the under £75 or the over £75 category. While it was definitely tempting to throw some money at the problem it was decided that it would be just as much fun building a cheaper robot. Of course the £75 limit was for the robot that would run on the day, it didn’t include anything needed for R&D in the run up to the competition. Because there was such a limited budget the early focus was finding the best components at the lowest cost. Clearly we needed a Pi and the obvious choice was the B. In broad brush terms we also needed a platform, motors and controllers, power, sensors and a remote control for the driving tests. Should you want to have a look at the finished design it’s now been open sourced and you can find it on the Ipswich Makerspace GitHub. Slowly the robot came together and each time it came to a makerspace meeting it was able to do something new, and occasionally it forgot how to do something old. The last two weeks were particularly frantic with the late night soldering and debugging that no project should be without. Sadly, one of the development Pi’s gave its life for the project but we had a spare so all was not lost. The R&D effort was helped no end by the generosity of Rapid Electronics in Colchester who gave us a considerable amount of hardware. (Including the sacrificial Pi, please don’t tell them). I’d not been to a PiJam before and with the addition of the competition the venue was absolutely buzzing with excitement. As well as Keith and Phil, we also had Frank in charge of the video camera, Tim and I in charge of morale, and TractorBot in charge of being the robot. Our first event was the robot sumo which is a far more civilized version of the old Robot Wars idea. Two robots go in and there is only one winner. The main difference was that no preposterously over-specced house robots were involved and everyone walked away with a whole and intact robot, as damaging your opponent was against the rules. Keith drove TractorBot via Wii-mote and by driving skill and low cunning pushed the first two opponents off the mat. Sadly there was no way we were going to be able to push the giant pirate ship so easily and after some hair raising twists and turns the inevitable happened and we were out. In all, a pretty good first test. I’ll run through some of the other tests in later blogs, look out for the closest to the wall test and the three point turn test. This year’s team includes Keith and Phil as before with Jon Leach and me Steve Chalkley. There are two major differences to the 2015 competition from our perspective. The first being the division of the entries into size categories rather than budget. So far it looks like we’re very firmly in the up to A3 category. The second is that with a little tweaking we could probably re-enter TractorBot. Obviously that’s not what we’re going to do even if TractorBot II looks similar to the original, strikingly similar. Over the next few weeks I’ll be sharing some of our design thoughts, for example, TBII will most likely have a touch screen user interface replacing the push-button and blinking LEDs which was the low-cost solution to the same problem last year. It was remarkable how much control one button could exert. Finally, I can’t let you go without answering the question you’ve been dying to ask: how did we do? I’m pleased and proud to say that thanks to Keith and Phil’s combination of hard work, mad coding skills and dangerous driving we won the under £75 category. 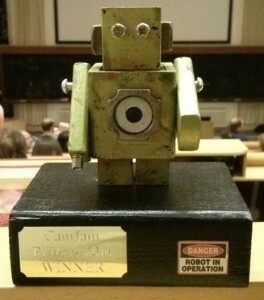 Which meant they walked away with some very cool Pi related goodies and the cute robot trophy. We even have video highlights to prove I’m not making it up.